A medium-sized finch with the adults having a long brown tail and are a brown or dull-brown color across the back with some shading into deep grey on the wing feathers. Breast and belly feathers may be streaked. These birds are mainly permanent residents; some eastern birds migrate south. Their breeding habitat is urban and semi-open areas from southern Canada to Mexico. 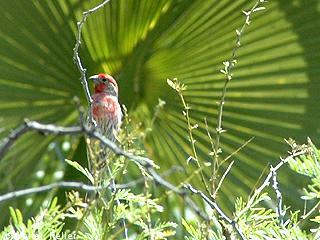 House Finches forage on the ground or in vegetation. They primarily eat grains, seeds and berries, being voracious consumers of weed seeds such as nettle and dandelion; included are incidental small insects, such as aphids and plant lice. Originally a resident of the southwestern United States.